We are consistently committed to excellence. It’s hard to believe that we are already over a month into 2018! One big, new development Berthold Academy is starting this year is a full-day summer program. The session begins June 25 and extends to August 17. We are accepting applications from currently enrolled families and outside families that may wish to try our Montessori approach to personalized education. There is a substantial “early bird” discount being offered. So do not delay. Even if you plan on vacationing this summer, there are weekly and monthly options available, as well. There is limited available space, so if you think you might be interested, please submit the interest form by going on our website. Lower elementary students have been working hard on their science and cultural studies. The younger students have learned about the usage of a compass and cardinal and ordinal directions. They are also working on stellar nucleosynthesis (how stars are formed), planet study, and study of stars. In addition, they have been working on the layers of the Earth’s interior. Continuing that study, the older students are working on the lithosphere and hydrosphere. They are learning about various land and water forms. The older students are also working on defining the Earth into four hemispheres, and beginning to locate places using latitude and longitude coordinates. The younger children are working on identifying unique characteristics of vertebrates and understanding the taxonomic classifications. The older students are also working on the the five kingdoms of the biosphere and characteristics of invertebrates. Upper elementary have been dissecting owl pellets to discover what the owl has feasted on. Students brush off the bone fragments they find and try to match the bone size and structure to an animal skeleton that would normally be part of the owl’s diet. This information helps scientists study ecosystem diversity and stability. Students also learn the scientific names of the different parts of the skeleton they find. They lay out and try to reconstruct the skeleton using the bone fragments they find in the owl pellets. This process utilizes hands-on experiential learning that demonstrates the real-world application of scientific knowledge. Middle school students have been diving deeply into genetics. They have performed practical exercises illustrating how traits are passed down based on gene dominance and, of course, probability of outcomes. Using Punnett Squares, gene pool demonstrations, and replicating DNA structures, students have had hands-on experiential learning opportunities that make genetics fun and meaningful. Most recently, the students participated in a passionate, formal debate on the ethics involved in stem-cell research. Students researched the affirmative and negative positions and had to argue one side. Many students argued the side that opposed their personal viewpoint on the subject as a means to create a more interesting and balanced experience. We have been challenging ourselves to engage in mindful conversations. Therefore, we not only practice listening, but how we feel in our bodies when we hear different voices at different volumes. We are trying to be fully present in our conversations, giving someone our full attention and not simply “waiting to talk.” Students have been doing well with this practice. It isn’t easy, but they seem to value the difference it makes in our social interactions with friends, classmates, family members, and society. Upper elementary have made some delicious soups using a wide range of ingredients and techniques. Just today, I sampled a shrimp/seafood soup and a corn chowder that had a touch of citrus flavor underneath. Middle school have been crafting soups as well. As seen below, middle schoolers were invited by 100 Bowls of Soup owner Katharine Mardirosian to experience working in a commercial kitchen. Using locally grown whole foods, they began by making a French mirepoix: onions, carrots, and celery (using the 2:1:1 ratio, respectively) and then followed two slightly different recipes to make two versions of minestrone. Ms. Mardirosian commented, “Needing very little training, they got to work right away prepping, chopping, sorting, measuring, cooking and cleaning.” They smelled a variety of spices and categorized them into spice families, noting what flavor each would add to the recipe. One of our students was even able to process some sales transactions at the front register. Upper elementary students are exploring the MicroBit: a small programmable circuit board developed by the UK Government. The MicroBit is a self-contained unit allowing for programmable control of its 5x5 LED array. It also contains sensors like Accelerometer and compass. The students spend their first few weeks making music and using motion to control the LED array on the MicroBits. All programming is done using the visual programming language Blocky (very similar to Scratch) specifically designed for the MicroBit. The middle school students are tasked to design and create a transformable object. (in accordance with the trimester theme of “Transformation”) The object should be relatively big (2 feet x 2 feet) and is 80% created by 3D printing. Students can design one object, or a set of objects that act and work together. Design can be done using any 3D modeling software, such as Tinkercad, or inside VR. Most groups are currently in the prototyping, design phase where they are creating scaled down models of their unique designs. The Design Thinking “Wheel” Process was discussed again, this trimester. All students will work as individuals and each selected a designer as their source of inspiration: CoCo Chanel, Giorgio Armani, Christian Dior, and Vivienne Westwood. The students are individually designing a complete outfit (“ensemble”) for different seasons. The ‘typical’ ensemble will consist of 5 pieces of clothing: a ‘top’ (ex: shirt or blouse), a ‘bottom’ (ex: pants, shorts, skirt), jacket, some sort of footwear (ex: shoe, boot, sandal), and an accessory (ex: scarf, cap, socks, gloves). For each session, the students will design an “ensemble” for both genders. ‘TRANSFORMATION’ is to be a central theme for their clothing line. Students are learning rock song covers including the White Stripes’ “Seven Nation Army,” Nirvana’s “Smells Like Teen Spirit,” and Devo’s “Whip It.” It’s great to witness the band members confidently attempting to play instruments that they have never played before. Effective communication is a must in any musical group; thus, students must really focus and listen to one another so they that all play in harmony and at the same tempo. We are, as you can imagine, having a lot of fun, too! In this trimester's art elective, students are investigating the meaning of art and applying the literal meaning of transformation to sculpture and other 3 - dimensional art. Students are exploring how to transform a variety of material into art: clay, paper, found objects, and popsicle sticks. Each student is in the process of selecting a sculptor or 3D artist to study. Each student has, or will lead, the class in creating a type of sculptor or 3D art. Lower Elementary: In lower elementary art, the students are exploring and understanding the differences between the first, second, and third dimensions. They have been building 3D art using recyclables such as paper, egg cartons, paper mache and foam. In music, the students are focusing on pitch recognition. We have explored the C major scale using the tone bars. Students discovered the pattern of whole steps and half steps in a seven tone major scale: whole, whole, half, whole, whole, whole, half. By recognizing the pattern we were able to transpose to D major. Students then realized that we needed to add 2 sharps to maintain the same major scale sound. Each student took turns playing “Twinkle. Twinkle, Little Star” in both the C major and D major scales. 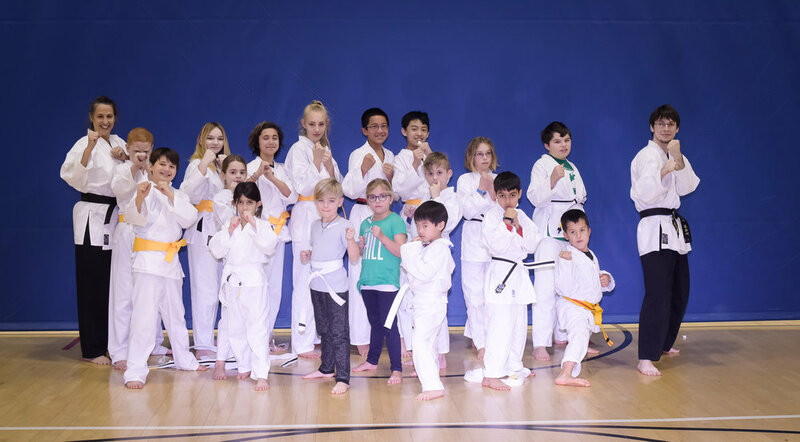 Congratulations to our TaeKwondo students for completing the eight week course, and for practicing the forms, routines, and memorizing the all-important “Tenets of Taekwondo.” Thank you, Linda Carr, for being such a great instructor and role model for our students. In lower elementary, students have learned their first complete yoga sequence! Ask your child to show you Sun Salutation A: a short series of poses designed to warm up and strengthen the body. We are also working on more complex postures and learning the names of commonly used poses. In upper elementary and middle school yoga, we have selected 3 strength and endurance based poses timed once a month to track progress toward building more holding power in the muscles. We are also working with reflecting upon and evaluating our actions and behaviors in regards to achieving the big goals each student set in the previous trimester. Ask your child what his or her big goal is and what is being done on a daily basis to achieve that goal. Ask what is going well and where there may be a need to revise or modify the original plan. Lower elementary students are studying sentence analysis with noun families, verbs, and direct objects. We just introduced prepositional phrases as direct objects. They are analyzing English sentences paired up against the same sentence in Spanish to determine similarities and differences in grammatical structure. Upper Elementary students are practicing regular -AR, -ER, and -IR verb endings and analyzing simple sentences with noun families and direct objects. They are beginning the unit of study on cuisines from different Spanish speaking cultures to prepare for the culinary room transformation into a Spanish restaurant. The middle school are working on regular -AR, -ER, and -IR endings and sentence analysis with noun families, verbs and direct objects. Middle school will begin researching different Spanish speaking countries in preparation of the culinary room transformation into a Spanish restaurant. Recently, the middle school practiced speaking Spanish to the staff at Pollos Inka restaurant in Herndon. Students ordered their meals in Spanish and conversed with one another in Spanish over a delicious authentic Peruvian lunch. Thursday, March 15: Deadline for Discounted Rate on Summer Program at Berthold.